AN ARMED SUPPORT unit will shortly be operational along the border regions, under new plans being rolled out by the Garda Commissioner, according to Taoiseach Leo Varadkar. The Taoiseach was asked about the new unit being set up in light of Brexit, and the possibility of a no-deal. The Irish Independent reports today that there are plans to deploy armed support units on a round-the-clock basis to deal with the possible Brexit fallout. 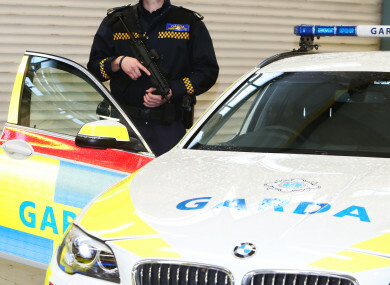 However, Varadkar said the additional garda unit would be “happening Brexit or no Brexit”, adding that additional resources are being ramped up nationwide. Earlier this year, Garda Commissioner Drew Harris dismissed a report that he had discussed a proposal to move 600 gardaí to the border in the event of a no-deal Brexit. He said it is being set up following joint work between PSNI and the Gardaí, which finds that 43% of organised crime has a cross-border aspect. People Before Profit TD Richard Boyd Barrett asked the Taoiseach if it is just coincidence that a new unit is being established near the border. “The position is we are improving garda resources all over the country,” stating that it should be a surprise to no one that the norther regions would also receive additional resources. “At the GRA conference as far back as 2016 delegates based in the border divisions called for the lack of 24 hr Armed support units in those divisions to be addressed immediately and indeed at the GRA conference in 2018 we called for an effective geographical spread of such units in the border region. Previously, Tánaiste Simon Coveney has said that in the circumstances of a no-deal Brexit, hard conversations with the European Commission about the border would have to take place. Speaking to reporters today, he said those discussions with the EC haven’t taken place yet, adding that those discussions won’t be happening until a no-deal becomes a certainty. “If Britain crashes out in an unmanaged way, I think Britain too has said that there will need to be a serious negotiations about how to avoid physical infrastructure on the border and retain peace on the island,” he added. Varadkar later said in the Dáil that in a no-deal, discussions would be needed with the European Commission on how to maintain open borders and protect the single market. “People talk about alternative arrangements but the only thing written down that works in law and reality is what’s contained in the backstop,” he said. The Cabinet today received a further update on the contingency preparations for a no-deal Brexit scenario. Coveney said the government is committed to maintaining the Common Travel Area, and today it finalised the remaining domestic decisions necessary to conclude the Common Travel Area arrangements. He added that the Irish government is now ready to sign a full memorandum with UK to safeguard all elements of the CTA. Updates were also provided around preparations for ports and airports, with the Tánaiste stating that work on temporary infrastructure at Dublin and Rosslare ports is well underway. By the end of March, Revenue will have over 400 additional staff trained and in place, while the Department of Agriculture, Food and the Marine will have over 200 additional staff trained and in place. “Everyone is looking to next week where a vote will be held in Westminster and a deal will be ratified. “Worst-case scenario of a crash-out Brexit, we will do everything we can to support Irish people and the economy,” said Coveney. He added that some of the EC-based no-deal preparations progressed today. This includes a six-month grace period for airlines being put in place in the case of a no-deal scenario, which will allow airline owners make any necessary changes to its shareholder arrangements. Email “New armed Garda unit for border region, but Taoiseach says it would be rolled out even if Brexit wasn't happening ”. Feedback on “New armed Garda unit for border region, but Taoiseach says it would be rolled out even if Brexit wasn't happening ”.